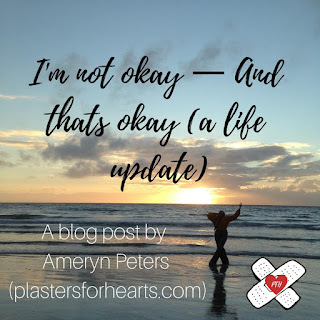 Just some quick trigger warnings to keep you lovlies safe: there is mention of depression, self harm, and eating disorders in this post. Recently I was in a toxic relationship which caused me to slowly spiral into depression (and an eating disorder, although at the time i didn't know it). When the relationship ended, I quickly fell deep into dark hole that is depression. I had no motivation for anything and my self harm had started again, although this time it was worse than it had ever been. I found new and creative ways to destroy my body. (I won't go into detail about that because I don't want to give anyone any ideas) One of the main factors of my self harm is eating. I starve my body for two main reasons. One: I hate myself and my body and I want to destroy it. And two: when I don't eat for long periods of time, I feel dizzy and lightheaded, almost drunk. I like this feeling because it means I don't have to think about or deal with anything. I went to my psychologist and told him how depressed I was (I didn't tell him about the eating though) and he immediately referred me to my psychiatrist, who put me on medication about three weeks ago now. As one could imagine, not eating in combination with medication is bad, to say the least. I also went for a blood test to check the vitamin D levels in my blood as well as my thyroid, which could both be contributing factors to my depression. I'm still waiting to hear those results. Two weeks after my psychologist/psychiatrist appointments, I had a major breakdown. I realized how much my not eating was affecting my music. In my lessons I couldn't play anything properly because my hands were shaky because I'm on anxiety meds and obviously not eating. I had lost all motivation and I felt like a terrible musician. I went to my school counselor's office in tears and told her everything. She listened, and after I had finished crying, she gave it to me straight: if I was going to continue on the destructive path I am now, I won't be able to keep up with school and I probably won't get into university and study the two things I love most in the world (music and literature). I was scared. She also said that I might have to be hospitalized again. That, too, scared me, because I HATE hospitals. I had also spoken to my Afrikaans teacher the previous day about it and she told me that one can become infertile from an eating disorder, which I didn't know. This scared me a lot because I've always wanted to have children and be a mother. So I decided that I need to get better, whether I want to or not. The next day, I went to Jon (my psychologist), and told him to just keep quiet and listen to everything I had to say, which was a lot. He laughed and said "Okay, I'm fastening my seatbelt". Then I told him everything. I read him my diary entries from the past few weeks about hating myself and not eating and almost fainting all the time. Our session ran over about 40 minutes. He said that it was going to be okay. In my next session, we are going to unpack everything and talk it through so that I can process my trauma. Because the eating and the self harm is are just ways to deal with everything that's wrong with my brain. The next day, I went to Laura, my psychiatrist. She gave me an ultimatum which scared me: either I get admitted into hospital (which I passionately said no to), or she refers me to a dietitian. So obviously I had to choose the latter one. Oh, and she also DOUBLED my depression medication, which I found pretty funny. So I am getting help and on the path of recovery. I try to remember everything I spoke about in my blog post titled "Lies I've been telling myself about recovery".But I have to admit, i feel like a walking paradox. Because yes, I want to get better for my future but I also hate myself and want to destroy my body. Something that one of my music teachers, who I'm quite close to, told my is that the choice to get better is not only one choice. It is a choice that I have to make every day, every moment. And it's not easy. I am constantly exhausted, no matter how much I sleep, because of my medication and I have a very stressful and busy life. But I will get there. I know I will. But something that I've realized is that seeing the beauty in the world can help you see the beauty in yourself. This morning I woke up at 3:45AM and left the house and 5:30AM to watch the sunrise at the beach with my friend. I saw the beautiful sunrise over the reflections on the water and I danced on the coastline and felt so alive and part of the beauty of the world. I soaked my pants up to the knees and my toes turned blue from the cold, but it was the most alive I've felt in a long, long time. I am God's creation, and He doesn't make mistakes. So if you are going through anything similar to what I am at the moment, please try and remember that there is so much beauty in the world and that you are part of that beauty. I find that getting out into nature and doing things like what I did today reeaallly help with symptoms of depression. I hope you enjoyed this life update. Have a wonderful day, you beautiful creation!